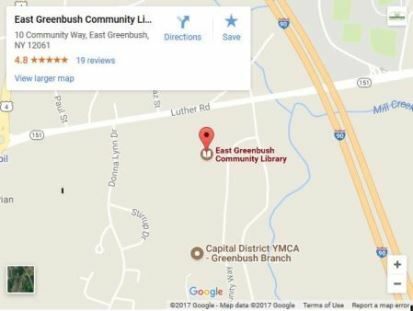 The Friends of East Greenbush Community Library is a non-profit, volunteer organization committed to creating broad community support for the East Greenbush Community Library as a major and expanding cultural resource and vital part of the East Greenbush community. Through a range of fundraising events (book & media sales, children’s festival, tote bag sales, Amazon Smile and special events), the Friends enhance programs and services that the library can offer. Many of these programs and projects promote literacy and learning, and all contribute to a strong community supported by a strong library. Click here to see all the ways you can help support the East Greenbush Community Library. The Friends meet at 6:30 pm on the third Tuesday of the months of February, April, June, September and November in the East Greenbush Community Library. New members are encouraged to stop in and meet us to join this important community group. The Friends of the Library meetings are held on the third Tuesday of the months listed below at 6:30 pm. All members and those interested in learning more about the Friends are encouraged and invited to attend.